The local Twin Cities office of the National Park Service, known as MNRRA, the National Mississippi River and Recreation Area, has provided clarification on who it was within the agency who made the decision almost four years ago to reject the findings of a government consultant–which stated in an Ethnographic Study, that Coldwater Spring at the Bureau of Mines Twin Cities Campus property near Fort Snelling in Hennepin County, Minnesota, is a place of traditional cultural importance for Dakota people. For the Draft EIS, MNRRA’s Cultural Resources Specialist, Dr. John Anfinson, evaluated Coldwater Spring’s eligibility for the National Register as a TCP under 36 CFR part 63 and under National Register Bulletin 38, Guidelines for Evaluating and Documenting Traditional Cultural Properties. He found that Coldwater Spring did not meet the National Register criteria or the guidelines of Bulletin 38. MNRRA presented this initial finding in the Draft EIS. The last part of this statement was based on the fact that the Park Service had used an exemption to other requests for information based on assertion that release of certain information would jeopardize its decision-making concerning the disposition of the Coldwater/Bureau of Mines Twins Cities Campus property. By January 2010 when MinnesotaHistory.net did submit a FOIA request for this information, the decision about the disposition of the Coldwater site had finally been made, so there was no basis to refuse to release the information. This new document, released along with other documents in response to a Freedom of Information Act (FOIA) request from MinnesotaHistory.net, states that the internal review was done by Anfinson himself, involving no one else in the agency. The first page of the White Paper created by the Mississippi National River and Recreation Area to respond to a FOIA request for information about its decision in 2006 to reject Coldwater Spring as a Dakota traditional cultural site. Ned White photo. Usually when people submit FOIA requests for information from government agencies they are warned that the agency is only required to release existing documents, not to create documents when they do not exist. In this case MNRRA was asked to provide documentation of the internal review described in the Coldwater/ Bureau of Mines Twin Cities Campus draft EIS prior to the release of the impact statement in August 2006. In response, MNRRA stated that there was very little documentation on how the decision was reached, so MNRRA had to create a document to explain the review process for what turns out to have been the Anfinson decision. The result is the document included below in its entirety. There is a lot to say about the information and the reasoning shown in the document. One can easily dispute some of the statements recorded in the document as fact. Furthermore, it should be noted that the document provides little support for the decision Anfinson made, except to say that he made the decision. Based on the criticism Anfinson himself sought to apply to what Dakota people said about Coldwater Spring as a traditional cultural place–that it was not well documented–one could easily question the legitimacy of the Anfinson decision. All of this and the information provided in other documents the Park Service released under the FOIA request will be discussed in the days ahead. In the meantime, here’s what MNRRA says about how it decided to ignore its own consultant and to reject the beliefs of Dakota people about Coldwater Spring. There is little documentation concerning the Mississippi National River and Recreation Area’s (MNRRA) determination that Coldwater Spring did not qualify as a Traditional Cultural Property (TCP), under the requirements of the National Register of Historic Places, prior to August 18, 2006. The reason for this has to do with the relationship between the National Environmental Policy Act (NEPA) and the National Historic Preservation Act (section 106) processes. The final determination on the TCP status was open until MNRRA sent out the final MOA for signature on January 20, 2010. And, MNRRA is still willing to consider the designation. For the Bureau of Mines (BOM) project, the cultural) resources review, including the Traditional Cultural Property (TCP) evaluation, has fallen primarily under the section 106 review process. For the purposes of the BOM Environmental Impact Statement (EIS), MNRRA decided to conduct the section 106 process parallel to the EIS process, although the studies and consultation undertaken for the section 106 process informed the Draft EIS and Final EIS. MNRRA is complying with this provision of the Advisory Council’s regulations, as a Memorandum of Agreement (MOA) has been Written in compliance with section 800.6(c). Under section 800.4, identification of Historic Properties, a Federal Agency is to “Seek information, as appropriate, from consuming parties, and other individual and organizations likely to have knowledge of, or concerns with, historic properties in the area, and identify issues relating to the undertaking’s potential effects on historic properties.” And, specifically, a Federal Agency is to seek information from American Indian Tribes regarding sites “which may be of religious and cultural significance to them and may be eligible for the National Register.” MNRRA did both. MNRRA consulted with those American Indian communities that had shown in an interest in Coldwater Spring and with the Minnesota State Historic Preservation office (SHPO). The American Indian communities consulted included the: Lower Sioux Indian Community, Prairie Island Indian Community, Shakopee Mdewakanton Sioux Community, Upper Sioux Community, Sisseton-Wahpeton Sioux Tribe and the White Earth Band of the Chippewa. MNRRA also included the Mendota Mdewakanton Dakota Community, which is not a federally-recognized Tribe. MNRRA would subsequently consult with 10 Dakota tribes. To more fully understand the American Indian history associated with Coldwater Spring, MNRRA contracted with Summit Envirosotutions, inc., and Two Pines Resource Group, LLC to complete an ethnographic study of the BOM property. (See The Cultural Meaning of Coldwater Spring: Final Ethnographic Resources Study of the Former U.S. BOM.) The contractors submitted their final) report in June 2006, and the Draft EIS was released on August 18, 2006. Section 800.4(c) states that once a Federat Agency has gathered the information concerning historic properties, the agency “shall apply the National Register criteria (CFR part 63) to properties identified within the area of potential) effects” in consultation with the SHPO and any Indian Tribe that attaches religious and cultural significance to identified properties. The Federal Agency has to conduct the evaluation as guided by the Secretary’s Standards and Guidelines for Evaluation. MNRRA complied with section 800.4(c) after receiving the final ethnographic report in June 2006. For the Draft EIS, MNRRA’s Cultural Resources Specialist, Dr. John Anfinson, evaluated Coldwater Spring’s eligibility for the National Register as a TCP under 36 CFR part 63 and under National Register Bulletin 38, Guidelines for Evaluating and Documenting Traditional! Cultural Properties. He found that Coldwater Spring did not meet the National Register criteria or the guidelines of Bulletin 38. MNRRA presented this initial finding in the Draft EIS. The TCP review process under Section 800.4, however, was just beginning. MNRRA’s position stated in the Draft EIS was simply an initial finding and open for discussion. MNRRA staff (Kim Berns, Steve Johnson, and John Anfinson) met with SHPO staff (Britta Bioomberg, Dennis Gimmestad, Susan Roth and Dave Mather) on August 29, 2006, to discuss a!) the cultural resources issues regarding BOM property, including MNRRA’s position on the TCP evaluation. At this meeting, the SHPO stated that it wanted to wait until the Department of Interior (DOI) selected a preferred alternative before negotiating a Memorandum of Agreement, as. there were too many variables in the draft EIS to consider in a Programmatic Agreement. (See attached meeting notes dated August 29, 2006). On October 4, 2006, MNRRA sent letters to the SHPO and the Tribes who had participated in the Ethnographic Study detailing MNRRA’s position on the TCP determination. Per 800.4(c) MNRRA asked the Tribes’ their comments and for additional! information concerning Coldwater Spring as a TCP. At this point, MNRRA had not made a final decision concerning the TCP. No Tribe nor the SHPO has replied to this letter or the analysis provided by MNRRA. (See the attached October 4, 2006, letters to Tribes and the SHPO). On December 23, 2008, MNRRA notified the Minnesota SHPO that the DOI had selected a preferred alternative, reviewed the potential impacts to cultural) resources and requested the SHPO’s comments on the undertaking. Then on January 22, 2009, MNRRA announced an open house meeting for Monday February 23, 2009, through letters to the SHPO, Tribal governments, interest groups and individuals on its mailing list. The meeting’s purpose was to collect public comment on reuse and restoration of the BOM property under the preferred alternative and to specifically gather input on the potential impacts to historic resources on the BOM property. On January 23, 2009, the SHPO sent a letter concurring with MNRRA that removing the buildings would constitute an adverse effect on the BOM Historic District and supported continued coordination between agencies as demolition work and landscape treatment for the property became more defined. The SHPO also asked MNRRA to “re-review” the TCP issue. On February 11, 2009, MNRRA wrote to 10 Dakota Tribes letting them know they should have received one letter on December 3, 2008, announcing the preferred alternative and another on January 22, 2009, inviting them to the open house scheduled for February 23. Superintendent Paul Labovitz stated that “My staff and I are available to discuss with you any concerns you may have regarding the preferred alternative, the site’s restoration, and the site’s future use and management.” In its announcement about the February 23, 2009, open house, MNRRA specifically stated that historic preservation was one of the key topics for the meeting (see the January 22, 2009, announcement and related handouts attached). The 10 Dakota Tribes were: Lower Sioux Indian Community, Prairie Isiand Indian Community, Shakopee Mdewakanton Sioux Community, Upper Sioux Community, Sisseton-Wahpeton Sioux Tribe, Fort Peck Assiniboine and Sioux, Flandreau Santee Sioux Tribe, Spirit Lake Dakotah Nation, Crow Creek Sioux Tribe, and the Santee Sioux Tribe of Nebraska. At the February 23 public meeting, Cultural Resources Specialist Dr. John Anfinson answered questions and explained section 106 compliance to those who talked to him. He emphasized the need to develop a MOA and asked for what input on how what to address in it. Individuals, organizations, and Tribes were also asked to submit written and oral comments directly related to the section 106 process and development of the MOA. 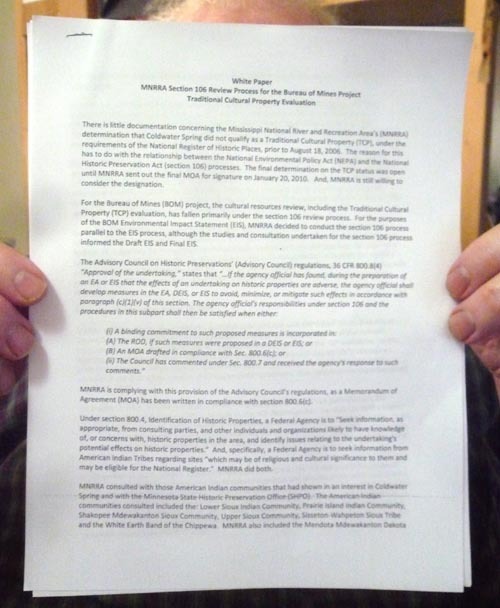 MNRRA took those comments related to the MOA and considered them in its drafting of the MOA. MNRRA notified the Advisory Council of the preferred alternative and the alternative’s potential impacts to cultural resources per Sec. 800.6(a)(1) of the Advisory Council’s regulations on February 26, 2009. MNRRA requested Advisory Council participation to resolve those adverse effects. MNRRA noted its position on the TCP determination. The Advisory Council did not respond. Therefore, MNRRA has proceeded per section 800(b)(1) of the regulations, which provides for proceeding without Advisory Council involvement. MNRRA also contacted the Keeper of the National Register Office on February 27, 2009, and specifically asked for advice on the TCP issue. The National Register did not reply. On April 28, 2009, MNRRA sent the Draft MOA and supporting documentation to the SHPO and requested their comments. The SHPO replied on June 1, 2009, and suggested that MNRRA develop a detailed protection plan for Coldwater Spring and Reservoir in developing the plan, the SHPO asked MNRRA to “take into account the importance of the area as ascribed by various groups (as documented in the WHEREAS clauses).” The SHPO also stated that there was “The need for additional consideration of the Traditional Cultural Property evaluation of the spring and NPS’s review of that study…” and asked that this be part of the discussion concerning treatment of the spring. MNRRA put protection provisions for the spring in the MOA and agreed to conduct more conversations with the consulting parties concerning the spring’s significance and treatment as the restoration process begins. On May 11 and 12, 2009, MNRRA sent the Draft MOA to all the Tribes and other consulting parties to the section 106 process and requested their comments on the document. MNRRA also offered to meet with the Tribes to walk through the document. MNRRA followed up with phone calls to each Tribe to reiterate its willingness to meet with them. No Tribes replied or sent comments on the MOA or raised concerns about the process. Up to this point, MNRRA was stilt open to changing its position on the TCP status for this section 106 review, if a community advocating for the TCP had come forward with the information we sought and had pushed for such a designation. The Final MOA is currently circuiting for signature by the consulting parties to the MOA. At every point in this consultation process, MNRRA has been ready to meet with American Indian Tribes to discuss the TCP issue. At any point during the consultation process, the Tribes or communities, as defined by Bulletin 38, that believed a Coldwater Spring was eligible for the National Register as a TCP could have asked to discuss the TCP issue. None did. Advisory Council on Historic Preservation staff link: http://www.achp.gov/staff.html. Who has a copy of the Two Pines Consulting ethnographic study? Is it true that tribes were notified AND there was no response? Why didn’t the Advisory Council respond when it was supposed to? And why didn’t the Keeper of the Historical Register respond when appropirate? Actually, the review for this was very comprehensive. Only 2 people could be found to provide testimony regarding the springs as a Dakota TCP. One was an unrecognized elder. This blog entry doesn’t even discuss why the springs were rejected! Dakota tradition requires pure water for certain rituals; with tap water being sufficient for many. Coldwater Springs’ h20 is decidedly NOT pure anymore, and anyone who tries to prove otherwise is looking forward to major intestinal distress. Interesting, BC or Dave, or Joe, or John. Where’s the evidence for what you are saying? None of what you says is supported by the information provided by the Park Service. Not even “John Anfinson” says what you are saying. If you send me the real evidence I will publish it. But why make up stuff? “Actually, the review for this was very comprehensive. Only 2 people could be found to provide testimony regarding the springs as a Dakota TCP. One was an unrecognized elder.” Where is this comprehensive review located? Why wasn’t there any talk going around about whose testimony was requested? No one I know knows of anyone who knows anyone who gave a testimony. And, who are you, BC? I don’t know who BC is but I have my theories. He is making things up or has been misled. There were several rounds of testimony on Coldwater by Dakota elders and others. Some came during the Highway 55 opposition. There was also a lot of consultation and interviewing done by the independent contracter who did the Ethnographic Study on Coldwater as a TCP in 2005-06. You can find the report still on a Park Service website. Here’s the link: http://parkplanning.nps.gov/document.cfm?parkID=150&projectId=11443&documentID=16567. This is the report that John Anfinson of MNRRA rejected summarily. Hello Bruce, it’s time I weigh in on the topics. I am the person who discovered the complete village of Camp Coldwater and started the preservation of this historic site in 1985. When I realized what I had found and the importance of this site , I wondered what should be done to preserve the site and all the artifacts and stories for all people, so they could learn the history of this gathering place and apply it to the present and future. I have studied every word, every story, every blade of grass and stone and all people concerning the area. This site was to be for everyone. A site to tell the story of Native Americans, pioneers, traders, the military, people on fashionable tours, men, women, children, who all came in contact with this historic site. This site also has an ecology tale to tell also. Unfortunatly greed of certain people have clouded the water. In all my studies NOWHERE is there found any mention of Camp Coldwater spring to have been used as a sacred site by any Native Americans. I did locate indian artifacts and reported them to Dave Radford State Parks liason. Gov Arne Carlson put together a group of professionals to examine the camp Coldwater site to determine its historic validity. I was made the tour guide. this team of archeologists included tribal counsel member Jim Jones/liason. I gave this team a tour and showed them the site of 2 stone mauls and bones outside of BOM property. It was to be given site # by law and examined. It never was. The team pored over my copy of EK Smith map and concurred with my findings that the village site was still intact. The report to the Governor was verbal . This site is still ignored by natives. A member of the HWY 55 reroute group, Mary X told me she was going to make up the story that Native Americans planted sacred trees exactly where the reroute road was going. She was going to get a native to report this story to media in order to stip hwy 55 from proceeding. I was present the day she did this. She lead this native out to the field and later came back. This person related the exact story Mary X made up to Bob Brown, Mendota band spokesman, who I was talking to at the time. I was furious with Mary. I told Bob Brown how she said she was going to get a native to repeat this story for the media to stop hwy 55. We discussed it. Mary X has previously stated she did this act on several website conversations about CCW. I had just shown Bob Brown and several other natives of his group Camp Coldwater spring. He said they never heard of it before, never visited it before, knew nothing of it. I did tell Bob Brown of Native American rights to abandoned federal land(reference AIM takeover of naval Base).He stated his band was not federally recognized. An hr later I overheard at this same hwy 55 gathering 3 Natives discussing if they could get federal recognition and could acquire federaly abandoned Camp Coldwater property, they could maybe get a casino built there and they would be set for life. Bob Brown overheard this and I quickly pulled him aside. He promised this would not ever happen. The media was exposed to the sacred tree lie by Mary X. This lie then was all over the news with the native appearance on Almanac show expressing the exact lie of Mary X. I have explained this lie to everyone since. I met with Mr Hotopp who was mediator in CCW sacred tree lies court action. He spent 2 full days with me going over all the collected history, walking over every inch of BOM property, and listening to the made up stories of the spring. After the sacred tree lies were exposed next heard was now the spring is sacred, then the waters are healing waters. All made up by an individual. The genie is out of the bottle. Gary Cavender, a personal friend and a founding member of the Dakota Society preservation group as I was, made a statement for natives about CCW spring. I called him and we talked. He never knew of Camp Coldwater spring until my lectures at our meetings. He mentioned Paul Durands book and the Dakota water God story. I spent several days with Paul Durand and know Paul Durands viewpoint on the Dwelling place of the gods story. I pointed out the Dakota story explicitly says the springwater flowed into the Minnesota river, not the Mississippi like CCW spring does. Gary replied”oh, okay”. I remined Gary of Mary X telling the native the lie about the sacred trees, he replied , he remembered her as she came to a Dakota Society meeting once. Gary made comments about the native person who lied. That it was wrong. I told Gary that there are several springs within a rocks throw of CCW spring, why aren’t these springs sacred, Gary replied “really?” I didn’t know that. I explained Paul Durands view point on the sacred spring with the tunnel leading to the Minnesota River. Paul told me as a boy he discovered also the spring by the federal building where there is a hole in the ground where you can lower a bucket to the water below. This spring tunnel leads to the Mississippi River. You can access this cave and walk all the way back to the hole in the ground. Gary replied, “really, we should have someone check into that.” I discussed the sacred tree lies, the sacred spring lies, Gary replied that the water god could be in every drop of water in the dew in the grass. I asked him if then every drop of water everywhere should be sacred, He replied “that would be impractical, the water god is usually blamed for something that happened bad to a native at that particular place and moment.” Gary made statements about how the government has been treating Dakota for years, this is a gotcha moment for the government and that they will get over it. I will save the exact words for private conversation. I am the person that discovered the Traverse des Sioux site and am responsible for getting the land and interpretive center built. I have personally put in place guidelines used to protect Native mounds in bloomington and elswhere. I have personally saved Shakopee spring/Faribault springs from destruction, also the mounds in Veterans memorial park in Shakopee and numerous other places. There is enough history at Camp Coldwater springs so that you don’t have to make up stories to protect it. If you make up a lie, you have to make up more to perpetuate the lie. This is wrong. Why is there no interest in the sacred island, Wakan Island, or the sacred rock, Red Rock, or Carvers Cave, or the dwelling place of the Gods hill? I know the answer to that, don’t I. In conclusion, the reason why I lectured the history of Camp Coldwater and the Traverse des Sioux sites to my preservation friends at the Dakota Society, was to bring together natives and the people of all nations, to learn of the history, the events that lead us to today, so that we can take the good from the past, and not repeat the bad. That we can enjoy together all of the diversity that all people have to offer to each other. So we can be better people, citizens, fathers, mothers, sons and daughters. So that we can give back something good to our future, instead of a legacy of discourse, of ill will. My 9th grade teacher, Mrs Applequist, I now understand, was my mentor! I say let go of the lies, and build upon a solid foundation of facts. They are there to guide you. Dave: Most of this you’ve told me before. I respect the fact that you have been a strong advocate for the preservation of Coldwater Spring, throughout a long period of time, sometimes in the face of opposition from both Scott and John Anfinson, who not only minimized the importance of the area from the point of view of the Dakota but also relating to the historical settlement of mixed blood people who lived there in the 1830s. I respect your ability to find a great deal of information most other people cannot find, and to locate remains of important places in the Coldwater area and elsewhere. But I do not think you know enough about Dakota history and culture to evaluate the meaning of Coldwater Spring for Dakota people. Some of what you say misstates what Dakota people have actually said about the spring and the surrounding area. Have you thought about the connection between Taku Wakan Tipi and the spring? Seriously, think about that from the point of view of Dakota spiritual beliefs and history, before claiming that this is all made up. It is difficult now to know exactly how Gary Cavender and Bob Brown would respond to what you have said here, since they have both passed on. I can only imagine. I do know that Gary Cavender is recorded on tape saying the things that you claim were made up and saying much the same thing in a legal affidavit. Are you saying that he was lying? Perhaps you should consider that not everyone tells you what they know when you talk with them about Coldwater Spring. If you told me something and I nodded my head, without telling you that I knew it already, would you later say that I got it all from you? Do you assume that all Dakota spiritual beliefs are going to be in the written documents that you find? Again I respect and thank you for your stubbornness about supporting the preservation of the Coldwater Spring area, but I think you are making the same mistake that the Anfinsons have made, connecting the beliefs about Coldwater with particular people who voice them, rather than evaluating the beliefs on their own merits. Do you understand that there are people who don’t accept the importance of Coldwater for any people, simply on the basis that Dave Fudally is one of the supporters of Coldwater preservation? Maybe if you understood that, it would put all of this in a different perspective for you. Hello Bruce, thankyou for allowing my point of view and my facts to be presented. What I stated is true. I personally knew Gary, Bob Brown, and Paul Durand, and a number of elder Dakota who took the time to talk with me for hours on the phone, or gave lectures on Dakota religion beliefs and way of life. I have read every book I can get my hands on for 25 yrs from Wisc to the Rockies on all native americans. No I do not have a degree like some people believe is the proof of knowledge on any subject. I can match my knowledge on the Dakota people of the past as well as anyone. I am not paid by anyone for my opinion or facts I present.The facts are the facts. I knew Gary and Bob and they knew me. Bob Brown wanted me to be his tribal historian before he died. I declined. Bob Brown gave me the indian name the Buffalo teacher, as I explaned to him knowledge of the past is his new buffalo, and through knowledge of the past he will be better able to move forward. Gary had a deep sense of sorrow teaching us the tragedy of the Dakota past. He also had the funniest sense of humor. It was what endeared him to us all as he spoke. He laughed then during my conversation with him saying the words spoken and written “was a gotcha, like when you goose someone. The government has been screwing with the indians for years, they’ll get over it.” Yes this was after his written statement and testimony. I gave him my knowledge and several books, he was able with others to get the Traverse des Sioux site built. From my knowledge and books Gary was able to save the mounds in Shakopee and be a part of a veterens memorial as he was a suufering vet. I don’t need you or anyone to try and tell me I don’t know Dakota history or people. You are wrong to assume that opinion and wrong to state it. If you had a year straight to sit with me I can tell you of all the native talks I had with elders as a member of the Dakota Society and on my personal time. Furthermore my collection of native american books is second only to the Mn Hist Soc. I have nothing to prove to anyone. Facts are facts. Lies remain lies. One of the Pond brothers was talking with Chief Cloudman about Dakota religion. Cloudman expressed that not all Dakota believed in the Dakota religions beliefs and practices. That these views did not express the life of all Dakota people. Religious practices are fluid, forever changing in all lives of man. Not always written as each medicine man or religious figure in any society has his or her own agenda. I recognize Dakota spiritual paractices, just not those based upon lies. Again a lie is a lie. It is documented about the dwelling place of the Gods. Mary Eastman, pond Brothers, etc. Fact! Springs abound everywhere in the area. Which spring, the one they mentioned flowed into the Minnesota river. CCW does not. Fact! However being sacred was only after I told Bob Brown of the law that allows natives to receive abandoned federal land. FACT! I feel sorry for those people who believed in the lie, that Mary X made up and told to Dakota people about the sacred trees ,to try to stop the hwy 55 reroute. I feel sorry for those people who were told that CCW was the sacred spring so that someone could be the new caretaker of the property . Why wasn’t it the spring in the N.E. corner, or the South side of BOM property?Why not the spring with the tunnel? Why is there no ceremony at the dwelling place of the Gods hill? Redrock?Carvers cave, Wakan Island ?? CCW spring only came into view when I told Bob Brown of the law that gives native americans receivership of abandoned federal property. FACT! It is sad that aftewr 25 years, people are fighting over the control of CCW land for personal gain and personal agenda. I hoped native americans would have taken over CCW IF the federal government abandoned the property. It is why I told Bob Brown about this law and how AIM tried to receive the Naval air base in early 70’s. We are a nation of laws. They should be followed. It only took a couple of years to get the Traverse des Sioux site built. That was because everyone of all races and religions pulled together because of historical value to the future. It has all the same history as CCW. It just doesnt have the lies like CCW has to overcome. I have yet to meet one person who doesnt accept the importance of CCW because I am one of the supporters of the preservation of the site. On the contrary, I called every politician at the state capital to explain to them the lies of CCW and the real historical importance of CCW. It is why it is supported! My knowledge and preservation work is why the Aiken House still stands, the Pond house teaches thousands of children each year, why Bloomington ferry mounds still exist, Shakopee spring and mounds still exist, why people give tours of all the Old Dakota village sites, why archeological digs have been done at village sites, why Camp Coldwater is a NATIONAL PARK , why we have discussion on this subject. Why? Because I read something once at 2.am. about camp Coldwater and I was allowed to stick a shovel in the ground at CCW. IT IS WHY YOU HAVE THIS DISCUSSION BOARD! Keep knowledge flowing, not lies. Once again thankyou. 1. Mary X made something up and, sadly, everyone has believed this lie ever since, including some of your good friends, who have lied about it to stick it to the federal government. 2. No Dakota people knew about Coldwater Spring until you and Mary X told them about it. 3. In all the books you have read about Native American history and culture you never saw anything that said that Coldwater Spring was sacred. I know you believe these to be facts. To you they are facts, but just repeating that over and over again will not make them facts for other people. I suppose somebody might say that what you say is devastating to the case that has been made for Coldwater Spring as a Traditional Cultural Property. But even if someone were to accept the validity of any of what you say, it is simply not true that this is all there is to that case for Coldwater as a TCP. Even though I believe that Gary Cavender was not lying about Coldwater Spring, the case for Coldwater does not rest exclusively on his testimony. And just out of curiosity, do you have any documentation of your allegations about Gary Cavender? I know that ten years ago you said a lot of things about the Four Trees being a fraudulent issue, but I don’t recall you talking about Gary Cavender this way until the last nine months, now that Gary Cavender has passed away. Considering that you consider written evidence to be so important in documenting Dakota culture, where is your written evidence of what you say about Cavender, or of your having stated it before last year? I suggest you read all that online material on your own and then do a more complete analysis that acknowledges what the people you are arguing with actually said. It will probably be a lot more interesting for both of us when you do that. Dave, in looking over your statements I realize you were really not saying that Gary Cavender lied. Below is much of what you said in your comments about your conversations with him. It appears that these conversation were a bit one-sided. He apparently did not say a lot, except to acknowledge the points you were making. I’ve done much the same thing in my conversations with you. I have been polite and not contradicted you even when you said things with which I emphatically disagreed. The longest thing you report Gary Cavender is that the testimony he gave about Coldwater Spring “was a gotcha, like when you goose someone. The government has been screwing with the indians for years, they’ll get over it.” My reaction to this reported statement is the same as when you told it to me last October when we were standing outside the Historic Fort Snelling Visitor Center. I know you had this conversation with him. But I believe you may not have drawn the correct conclusions from it. Saying that something is a “gotcha” is not the same as saying it was untrue. I can understand his amusement that the information he presented was very difficult for the federal government to get around. But what he had not counted on was the stubbornness of the Anfinson brothers. Gary Cavender, a personal friend and a founding member of the Dakota Society preservation group as I was, made a statement for natives about CCW spring. I called him and we talked. He never knew of Camp Coldwater spring until my lectures at our meetings. He mentioned Paul Durands book and the Dakota water God story. I spent several days with Paul Durand and know Paul Durands viewpoint on the Dwelling place of the gods story. I pointed out the Dakota story explicitly says the springwater flowed into the Minnesota river, not the Mississippi like CCW spring does. he replied , he remembered her as she came to a Dakota Society meeting once. Gary made comments about the native person who lied. That it was wrong. Gary replied “really?” I didn’t know that. I explained Paul Durands view point on the sacred spring with the tunnel leading to the Minnesota River. Paul told me as a boy he discovered also the spring by the federal building where there is a hole in the ground where you can lower a bucket to the water below. This spring tunnel leads to the Mississippi River. You can access this cave and walk all the way back to the hole in the ground. I discussed the sacred tree lies, the sacred spring lies, Gary replied that the water god could be in every drop of water in the dew in the grass. Gary made statements about how the government has been treating Dakota for years, this is a gotcha moment for the government and that they will get over it. I will save the exact words for private conversation. Gary had a deep sense of sorrow teaching us the tragedy of the Dakota past. He also had the funniest sense of humor. It was what endeared him to us all as he spoke. He laughed then during my conversation with him saying the words spoken and written “was a gotcha, like when you goose someone. The government has been screwing with the indians for years, they’ll get over it.” Yes this was after his written statement and testimony. Bruce, On the lighter side of things, Gary about split a gut on this one when I talked to him on the phone. He actually hurt more from laughing so hard that I felt bad I told him this one. He told me his pains hurt so bad and that he had to go, laughing and hurting at the same time.